I love finding new accounts to follow on Instagram. There are so many amazing accounts and people doing such inspiring things. Now that you also can follow people’s stories I am even more into Instagram. Mike loved Snapchat, but I never could really get into using another app. Now, I love that everything is one place. It has made me dig into finding even more accounts to follow. So, in honor of fall I am sharing 6 accounts that I am loving right now for fall. Each of them has got me wanting to wander outside and enjoy the crisp weather as it is approaching a little more every day. Here are the ones we suggest from top left to right. Kim Nguyen: A Bostonian who is nabbing shots of the beauty of fall in the upper northeast. It is hard to not feel inspired for fall with the shots she is getting. Deer Home: A gorgeous feed created by a mother and French teacher. She is pulling together beautiful lay downs that have many of the key elements of fall. My Northern Story: One of our favorite accounts. Hailey does an amazing job of capturing her life in Norway with her little one and one on the way. Norway and Michigan have many aesthetic similarities, but they seem to hit seasons a little sooner than us so it has me completely excited for what is just weeks away here. The Mop Top: A fashion account that is also capturing fall very well. That shot of the birch trees in the fall is probably one of my favorite fall shots yet. It is gorgeous. Her looks are also great for fall as well. Eva Kosmas Flores: The woman behind Adventures in Cooking, which is a blog you should be reading. The recipes, the suppers, and more are beautiful. Currently, she is capturing all the feelings of fall and it has me wanting to hold an outdoor dinner party pronto! Emma Mitchell: Emma pulls together beautiful collections of items she finds and uses them as inspiration for watercolors and doodling that are very inspiring. Love her account and seeing what she is making. 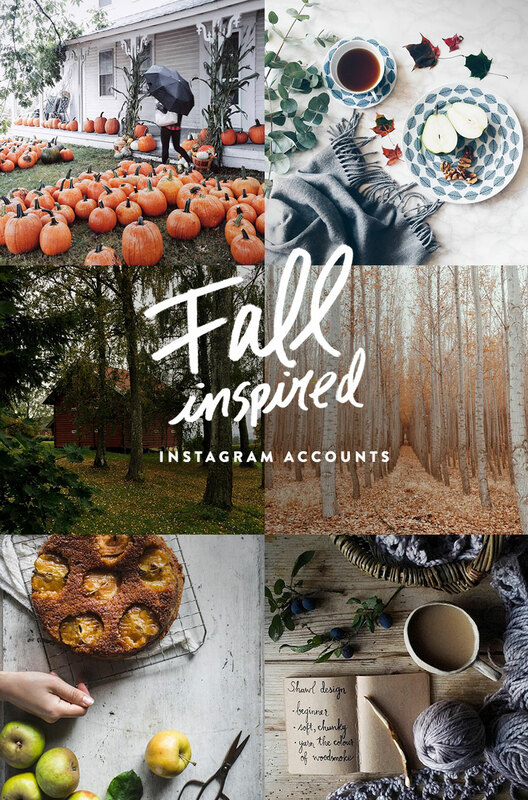 I would LOVE to hear which accounts have you excited for fall right now?! Happy Thursday friends. THESE ARE GORGEOUS PHOTOS. SO MANY TALENTED PEOPLE OUT THERE! Today is the first day it has felt like fall, so these suddenly are much more appealing. It was hard to look at steamy cups and chunky sweaters and pumpkins when the sun was shining and I was in shorts. The pumpkin shot is beautiful, but I do wonder what they are going to do with all those! Sell them? Turn them into purée? Compost? That’s a LOT of pumpkin!! I’ve always loved Instagram–and now i love it even more because of Insta Stories. I can’t wait to check out these accounts! Wonderful aCcounts, love to discover new ones! These are all so pretty and inspiring! Definitely getting me more excited for the season and wishing that fall would come to southern California! I love finding new accounts to follow!! Thanks for these!